When people ask me what part of Queen’s University’s student district I live in, a lot of people are shocked to hear that I commute from Toronto’s Union Station for biweekly classes; nearly two and a half hours away by train one-way. The priceless facial expressions in response to my answer are consistent; a look of confusion, mixed with some surprise,followed by a healthy dose of skepticism. In the absence of securing a fall sublet in Kingston, Ontario for the final semester of my undergraduate degree, I opted to live at home in Toronto and purchase a rail pass that would allow me unlimited travel for the semester. I knew what this would entail. Contrary to popular belief, free from any coercion, I voluntarily accepted spending upwards of four hours travelling from my doorstep in Toronto to my lecture hall in Kingston. Fortunately, the majority of my classes were online so I only needed to be on campus for a lab and seminar that coincided on the same two days per week. I realized that I would be spending nearly double the amount of time travelling to and from campus for the hours spent in class. In addition to studying and completing assignments, I also commit a handful of hours to JYI per week and am regularly marking and providing feedback as a TA for an online course. Dismissing 16 hours a week would lead to me sacrificing a work-life balance where I would be pushing my work into the late hours of the night, forfeiting sleep and timepreferably dedicated to downtime. As tiring (and sometimes infuriating) the commute and delays were, I refused to accept this had to be time I simply lost. 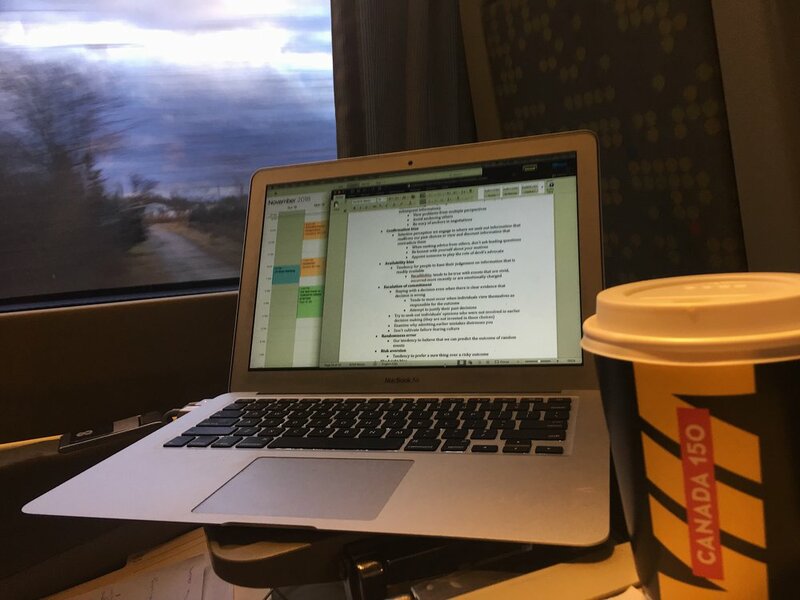 On the train, I worked as if I were in a library or coffee shop. When the Wi-Fi proved to be cumbersome, I made sure I downloaded at least some material for offline work or turned my attention to textbook readings. I am no stranger to commuting, having done this since high school. Despite being “only” 20km away from home, getting to school involved a 10-minute walk to a bus stop, waiting a variable time for the bus to show, a 15-minute bus ride to the subway, a 35-minute subway ride spanning two separate lines, and finally a brief walk to school from the subway station. I repeated this in the afternoon and had a comparable route when commuting for various summer jobs in downtown Toronto. I know that I join a majority of fellow Torontonians in doing this as the city’s average commute time has peaked at 96 minutes both ways; the second longest commute of any city worldwide . However, it wasn’t until the end of Grade 11 that I began to adapt my study habits to exploit the time I spent away from a desk. On a bus, where space and Wi-Fi are not luxuries, I tried to have some notes or papers ready on hand to read or annotate. As an alternative, I capitalized on this time to organize my calendar, respond to emails on my phone, or attend to other smaller tasks. This left me with large chunks of time when I was at home or on campus to devote specifically to one project at a time without the burdensome interruptions from small – albeit time-sensitive – tasks. It is important to note this was a decision that arose from a necessity, and frankly, I would never recommend commuting 4hrs one way (especially over multiple years or more than twice a week). Nonetheless, being able to remain in Toronto for much of the week, I was able to extend a summer work contract that I would have been forced to rescind earlier and continue to network with individuals that I would otherwise not have the chance to. All of this was a supplement to improving my time management and task prioritization skills, which, despite having the least amount of available time out of any semester, led me to utilize my time more effectively than before. Remote access and telecommuting is becoming normal across multiple companies and organizations. At JYI, for example, this is practically the only way we work. Without having a staff that is motivated and able to email and work collaboratively using remote applications, we wouldn’t have been able to achieve the growth that JYI has seen over the past several years. As a TA for an online course, I don’t even need to be physically present at the institution where the course is taught. Contrary to what some individuals might say, I believe this actually supports the argument for achieving a work-life balance, especially as students. Stretching your capacity to work beyond a cubicle in a quiet library and modifying the tasks you can accomplish in different settings allows you to capitalize on time that would otherwise be lost from merely getting between point A and B. I am unable to do the things that I enjoy on the subway, train or bus, but by committing this time to accomplish tasks related to school or extracurriculars (rather than aimlessly scrolling through Facebook or glancing out the window), my time later in the day is available to do things like go for a run, watch the Raptors dominate the NBA this season, or catch up with friends (and sleep). Additionally, by knowing when I need to get off my train, this places a real deadline that I need to work towards. For folks that find it difficult to get work done anywhere but a dedicated study space, start small. Dedicate a portion of your commute to glancing at a paper for class or brainstorming ideas for projects. Print out assignments and annotate them while you sit on a subway or bus to class. What a lot of people might fail to appreciate is that this small investmentstill progresses you towards completing a goal. Ultimately, everyone has different work habits and study preferences. With New Year’s around the corner,try embracing a growth mindset and start to challenge the idea that commuting equates to time lost (even if it is only for one week at first). We only have 24 hours a day, so might as well make the most efficient use of it.Take this from someone who spent more time on a train this semester than in the library. When somebody you know gets headlice there are a few things you can do to help, brushing through the hair with a fine-tooth comb, treating hair with lice treatments and of course, putting the little monsters under the microscope. This is, of course, exactly what I proceeded to do. Making the jump from undergraduate to graduate studies may inspire intense feelings of accomplishment, pride, happiness, and … imposterism? Newly minted graduates who are stepping into higher degree programs often report feeling like an “imposter” in a sea of other graduate students who appear to be more intelligent, more qualified, and more capable of meeting all the requirements of a graduate degree. Often, these students feel like they are a fraud, someone who does not belong in such a group of highly intelligent individuals, and that it is just a matter of time before other people realize this too. These feelings are referred to as Imposter Syndrome, which affects both female and male graduate students. Clustered regularly interspersed short palindromic repeats- or the far catchier CRISPR for short is often described as ‘precise molecular scissors’. Parts of the system were first noted over 30 years ago but only recently has it been put together as an interesting example of bacteria protecting themselves against viruses. Having genetically modified bacteria before, I was curious to try the new technology myself so I ordered the basic CRISPR kit sold by The Odin and tried it out in my kitchen! It is officially the summer, also known as academic conference season. Over the years I have given a several poster and oral presentations. With my previous experience, I have compiled what I found works best for presenting data. Every year, thousands of undergraduates undertake summer research. Pursuing research during summer vacation allows students to experience full time research, get more work done on their projects, gain experience in new types of research, and make new friends. It can be hectic, but these summers make for an amazing time. As the school year comes to an end and undergraduates start their summer positions, I wanted to share some of my experiences and advice on how to make the most of your time this summer. Dr. Alexander Nikolich Patananan, vice-chair of JYI’s Board of Directors (BoD), writes about his educational journey, his time at JYI, and some other insights.